Microdermabrasion with the DiamondTome Skin Resurfacing System removes the dulling outer layer of skin to reveal your skins true radiance, while simultaneously stimulating collagen production. Effective for reducing the visible signs of sun damage, aging and clearing clogged pores, the DiamondTome System can noticeably diminish the appearance of wrinkles and improve skin tone and texture. During treatment, the diamond-chip coated DiamondTome wand gently lifts lifeless skin cells to reveal fresh new skin. There is no downtime required after your pain-free DiamondTome microdermabrasion session, and you will enjoy softer, smoother skin immediately following treatment. Compared to other popular methods of microdermabrasion that use a spray of loose exfoliation particles, the DiamondTome Skin Resurfacing System offers our skin-care experts unparalleled control and will not cause any adverse side effects. Treatments can be adjusted in strength to meet the unique needs of each patient. We often combine microdermabrasion with a chemical peel to accomplish even more toward smoother, tighter skin. 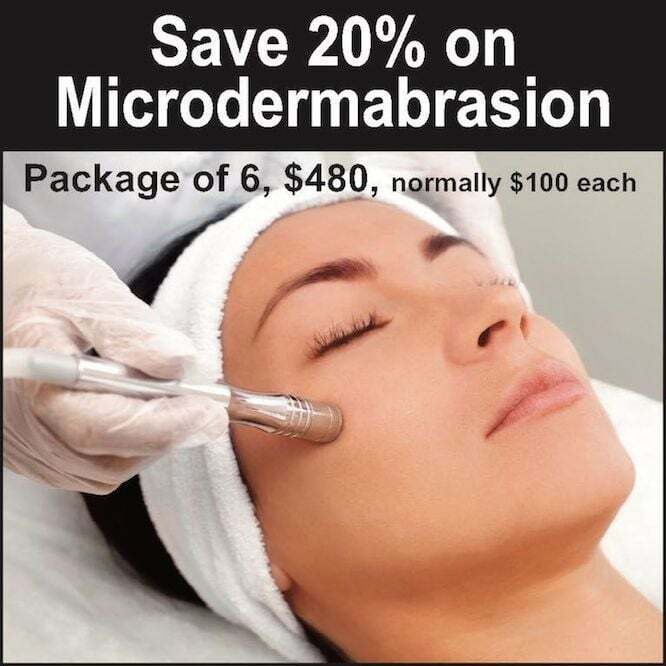 Microdermabrasion treatments are $100 each. The package price for 6 treatments is $480, which is 20% off, a savings of $120. A medical level customized treatment for anti-aging or acne clearing. Skin is analyzed, thoroughly cleansed, exfoliated, extracted and a customized mask is applied. Select serums, moisturizers and sunscreen complete this therapeutic facial. A mini facial to address clogged pores. Skin is thoroughly cleansed, steamed, extracted and select moisturizer and sunscreen complete the treatment. A micro-dermabrasion treatment is added to our customized facial for additional exfoliation. This combination treatment helps improve fine lines, pigmentation, clogged pores and overall skin tone and texture. Skin will appear smoother, clearer, bright and more hydrated.